In September 2009, we finally made the effort to see what is one of Nottinghamshire's largest and most impressive spiders. The location of Meta bourneti (Simon, 1922) had been well known to us for some time, but it is found in an inaccessible location at the best of times, despite being at one of the county's most visited attractions - the Sherwood Forest visitor centre. The actual colony is underneath a concrete manhole cover, which houses electricity cables for the centre. Making it even more inaccessible, is the fact that the cover is half underneath a wooden fence and virtually covered by soil most of the time. Thousands of people must stand or walk on this manhole cover and be totally unaware of what is underneath. On the day, we just turned up and said "we had come to photograph your spiders". As usual, the visitor centre staff were all extremely helpful and a crowd soon developed as work began to clear the soil from the manhole cover. Within a short while, the cover was cleared and eased off, to reveal a spider which was much larger than we had anticipated. There were several mature adults, with one female having an eggsac. The adults moved very little once exposed to the light and seemed docile enough, but on removing the cover, numerous small spiderlings made their bid for freedom. 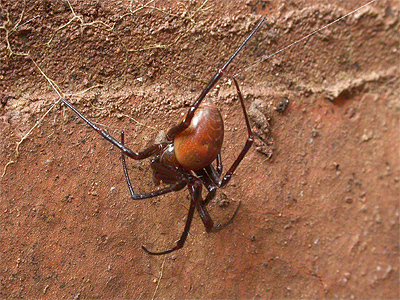 Meta bourneti is a very large and nationally uncommon spider, that is usually found in sites of complete darkness. 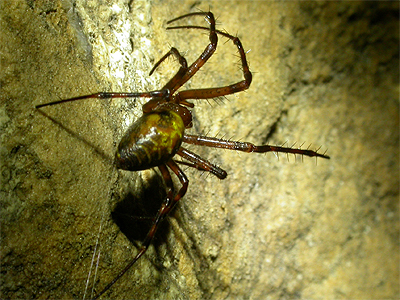 It's fondness for caves has led to the common name of Cave Spider - a name it shares with the very similar Meta menardi and which is just as large. Both species can occur include the middle sections of long railway tunnels, cellars and ice houses. There are believed to be two sites where Meta bourneti occurs in Nottinghamshire, with one of these being the Sherwood Forest visitor centre. Meta menardi (Latreille, 1804) - the UK's other Cave Spider, is the more common of the two and both species are difficult to separate. In order for reader not familiar with these spiders, both Meta bourneti and Meta menardi are more than comparable to Tegenaria gigantea (the large house spider often found in the bath during the Autumn) and some indiviuals may possibly be slightly larger. 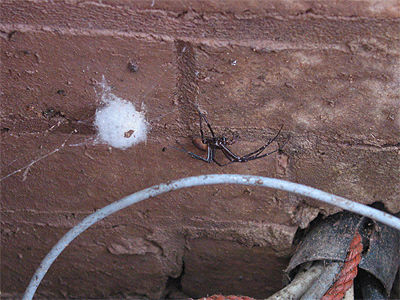 Compare the size of the female against the bricks in the photograph below. 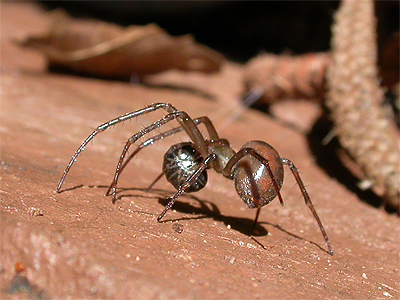 It was first discovered at Sherwood Forest by a British Arachnological Society survey team in 1978 and has remained ever since. The adults are repulsed by light, but spiderlings are attracted to it. This way, both Meta bourneti and Meta menardi should be able to colonise new sites. The Sherwood colony is not often disturbed and so the spider's only means of spreading to new sites, must be either when the manhole cover is removed and the spiderlings can get out, or they use the two electrical conduit pipes present, to move to other locations in total darkness. So far, it has not been found anywhere else at the visitor centre, but occasional specimens have been known to turn up on the walls of the visitor centre buildings. Whether this spider utilises the dead and decaying Oaks in Sherwood has never been confirmed that we know of. Possibly, such sites might be too dry, but it would be interesting to know if it is found underneath the nearby Church, or in the cellars of Edwinstowe's oldest buildings. In mid-April 2010, we again checked on the colony at the Sherwood Forest Visitor Centre, with Ranger Gary Joynt, volunteer Paul Sadler and numerous people who don't like spiders, but can't help but have a look. Four adults, at least three sub-adults and numerous very young spiderlings were present. 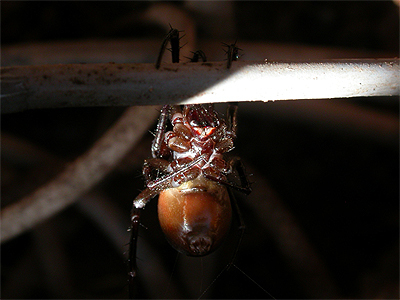 The spiderlings were probably from the eggsac in the above photograph from September 2009. Many new photographs of this large spider were taken on this visit, including very small (2mm) spiderlings, sub-adults and the characteristic epigyne of the female. 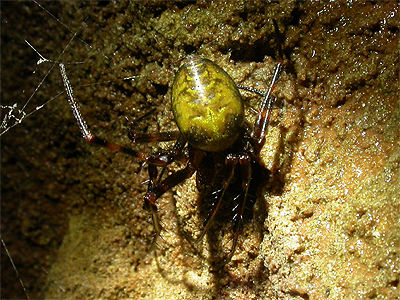 Meta menardi is the second of Nottinghamshire's cave spiders to be found only in sites of complete darkness. Most often found in caves and railway tunnels, it also occurs in cellars, ice houses and under manhole covers. 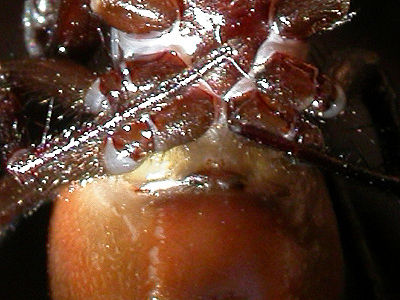 Although there are visual differences in abdomen colouration to Meta bourneti, accurate identification is best achieved by examination of the female's epigyne. 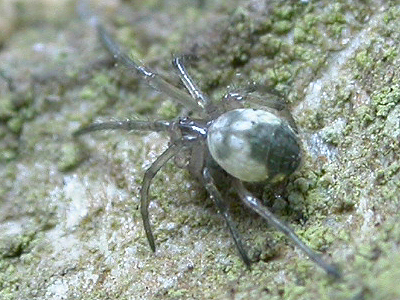 In Nottinghamshire, this spider is currently known only from the well-known caves at Creswell Crags - a site which straddles the Nottinghamshire and Derbyshire border. We visited Creswell Crags in early 2013 to lead a Cave Spider tour around the caves, which also provided us with the opportunity to photograph them. 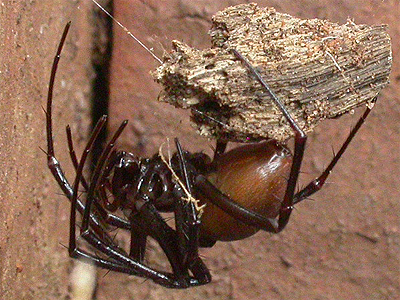 Nationally, Meta menardi is more commonly recorded than Meta bourneti, but this may possibly be through casual assumption that the latter spider is the least likely to be encountered. If you suspect that you have either species in your cellar, please do get in touch.